Jack Kerouac's life was a romanticized vision (based on personal integrity) deeply effected by senseless death, myopic critics, and a beat caricaturization of an insensitive public. Superficially viewed, his life appears to be a failed attempt at order, saintliness and the success expectations of his parents. Artistically, his intent is one of a "divine scribe," a contemporary chronicler of subterranean, beatific events centered around a life of the senses, silence and religious duty. His characters are on a religious quest whose journeys of physical ecstasy metamorphose into moments of cosmic awareness. Writing to know his visions of the world, thereby chronicling the various stages of his awareness, he makes associative leaps into realms beyond organized denominational religion. Catholic by birth and later incorporating Buddhist tenents, his life's vocation became that of narrator of his deceased brother Gerard's metaphysical insights into the road, interpersonal relationships, drugs and alcohol, death and life experiences. Kerouac's work is autobiographical, confessionally honest writing with seemingly unedited streams of consciousness. For the Kerouac Commemorative I sought images which sculpturally communicate and honor his philosophy of life and the genius of his literary talent. Conceptually, the park is structured in the form of a mandala; that is, a diagram of symbolic geometric arrangements designed to make clear the relationship between the quoted texts and the visual images which inspire them. Access to the park is provided by a continuous paved walkway bordering Bridge Street, the parking lot, trolley and adjacent green space. This peripheral walkway forms the shape of a square, and is bordered (as is the entire park) by trees. Four bricked accesses off this walkway form the image of the Christian Cross and symbolically place the entrant "On The Road" and into the adventure of Kerouac's quoted state of mind. 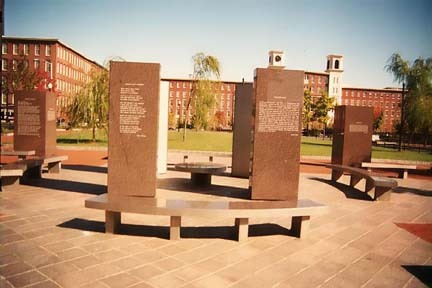 All quoted material throughout the park appears etched into eight vertical granite panels. 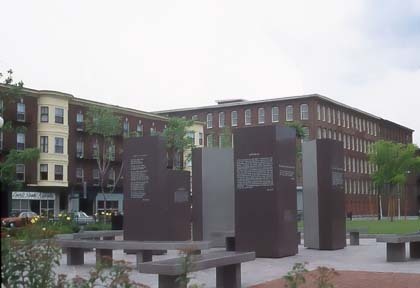 Moving counterclockwise from Bridge Street, the main entrance contains Kerouac's biography, and the three remaining accesses contain the opening paragraph quotes from the five "Lowell Books" and "On The Road". The Lowell material was written throughout his career, not in a strict linear time sequence. Kerouac stylistically uses both space and time collapses to capture instantaneously, the cosmic moment via memory or prophetic vision. Hence, he writes of his early Lowell experiences as a mature artist and often uses his birthplace as the cosmically stilled center around which the chaos of the world spins. Sharing a common border with the bricked cross are the broader paved surfaces which provide access to the endocardinal chamber of the park. These paved surfaces, in turn, form a second cross image which align the diagonal axis of the park. The underlying principal of the mandala is a series of radiating squares enclosing a circle. Numerically, the symmetry of the forms are based on the division or multiplication of the whole number four. Within the precision of these geometric arrangements are contained the random movements of the visitors and the thought provoking images of the quoted texts. The central chamber contains a circular granite seat, surrounded by wall surfaces of lightly reflective, burnished stainless steel. There are no quotations, only soft reflective surfaces. This is the meditative center, around which swirl the quotes, pathways and images of the park. Analagous to Jack's room in Lowell, Neal Cassady's attic in San Francisco or Desolation Mountain's ranger station, this centers' function is to create the meditative silence necessary for self reflection and creativity. The eight black granite surfaces of the four triangles facing the seating area of the center, contain quotes esoteric in nature. Kerouac was well versed in the use of Japanese Haihu and Hung-an of Ch'an Buddhism, e.g. short tests or problems, imponderable literary devices used to aid the mind in escaping the traps of duality; as when each exhilarating moment of joy is followed by circumstances of desperation; love is cancelled by death or separation; euphoria by physical degeneration and publication by ridicule and rejection. Emanating from these dualistic snares is the structure of a literary device, plotless, uninterrupted sketching of daily activities, capturing moments of cosmic awareness. Kerouac's writing is analogous to the spontaneity of the 'riff' in jazz music, the overall peripheral visual activity of Abstract Expressionistic painting, a spontaneous emotional response transcending constrictions of a physical existence. 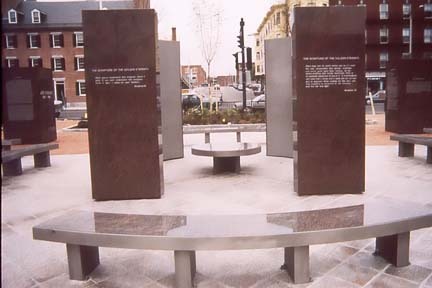 Jack Kerouac and in celebration of Lowell, Massachusetts. Through its symbolism and quoted material it will offer a space for reflection, restful shaded areas and green space for playful activities. I further see it functioning as a ceremonial area for the citizens of Lowell. Finally, a space with direct relevance to the lives of the people who visit and perform meaningful community activities with the parks spaces.